Tourism in Judea and Samaria is at an all-time high, with Israeli and foreign tourists flooding the area's historical and modern sites. One of the tourists who visited was a special guest of the Samaria Regional Council's Foreign Communications Department. 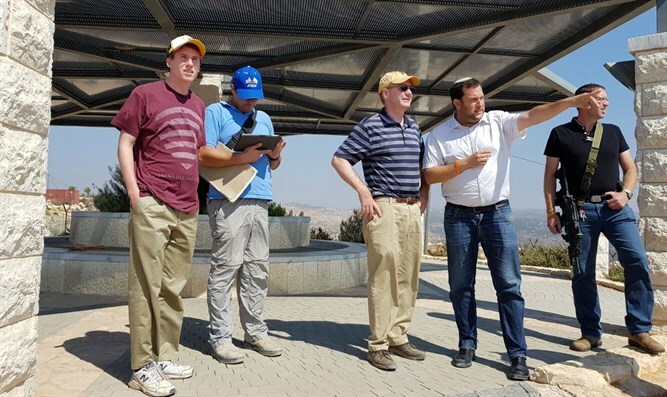 US Congressman Keith Rothfus arrived to tour Samaria together with his son. Rothfus visited Samaria two years ago, and decided it was an experience he did not want his son missing out on. During his visit, Rothfus visited "Israel's porch" together with Samaria Regional Council Head Yossi Dagan. "Public figures from around the world have become 'ambassadors' for Samaria in their home countries, after visiting here," Dagan said. "This is what happened with Congressman Rothfus, and it is of tremendous importance." "We are happy that Congressman Rothfus decided to come back for another visit in Samaria - not as a politician but as a regular tourist. We are happy Samaria has become an attractive tourist destination, not just for Israelis but for tourists from around the world." International tourism in Samaria made headlines in the past few years. Some of the area's most popular destinations among tourists from Japan, Europe, and the US include Sebastia National Park (Shomron National Park), Mount Gerizim National Park, and the Samaria Winery. During the tour, Rothfus said, "So many good things happen year, and I encourage everyone to come and visit. I was here two years ago, and now I'm back, bringing my son to see historical sites. To see the people who make the desert bloom. It's a fascinating area. I came here today to see historical sites, to visit local businesses where people do good work, and I think people need to see this all with their wn eyes." "I think people will be surprised by what they see here." Samaria is also preparing for its next big tourist season in September, when Jewish holidays mean family vacations and hikes. Rothfus is a congressman for Pennsylvania, and is a member of a Congressiona lobby which calls for the US to stop requiring Israel to make painful sacrifices for the sake of peace, and instead insist the Palestinian Authority recognize Israel's right to exist and stop attempting to destroy it.